Carol Deppe puts her advice on garden resiliency to work by growing different staples to feed herself at different times of the year. Corn and dried beans fill her belly in the spring; she eats fruit all summer; potatoes, winter squash, and fruit feed her in the fall; and potatoes and winter squash are on the menu in the winter. To these garden staples, Deppe adds duck eggs (and a bit of meat) from her flock, along with some purchased pastured meat and canned tuna. Deppe's staples are one one of the reasons I didn't get as much out of her book as I'd hoped to. Although I like the lack of wheat in Deppe's diet (due to her struggles with celiac's disease), Mark and I strive for a higher protein diet, so Deppe's focus on potatoes and other high-carb staples didn't sit well with me. I also don't really believe in the notion that you can stay healthy primarily based on supplements, so her use of cod liver oil to replace most meat in her diet doesn't seem like a nutritious long-term solution. On the other hand, I was intrigued by how well Deppe seems to listen to her body. She notes that she feels most full after eating foods high in water and fiber, and she used her own varying hunger levels to discover that she needed to eat animal-based omega 3s. After noticing that plant-based sources of omega 3s didn't fulfill her cravings, she did some research and discovered that only some people are able to turn 18-carbon plant omega 3s into 20- and 22-carbon animal omega 3s. Perhaps that's why some people crave meat much more than others do? "Food Production and Self Reliance in Uncertain Times"
If you're really worried about food security/availability, then you really need to include livestock in your plans. While you can survive on a plant based diet, you need meat to thrive, particularly if you work hard or become ill. Animals have the advantage of being harvestable on your schedule without waiting for MotherNature's schedule. Your whole year's harvest of crops can be wiped out in a day by a nasty hailstorm, etc. In time of prolonged drought, you can keep a few head of livestock watered more easily than irrigating 20 ac of corn & beans. I liked Carol's book, though didnt agree with everything. I think my main takeaway was to pay more attention, garden space-wise, to storage crops. 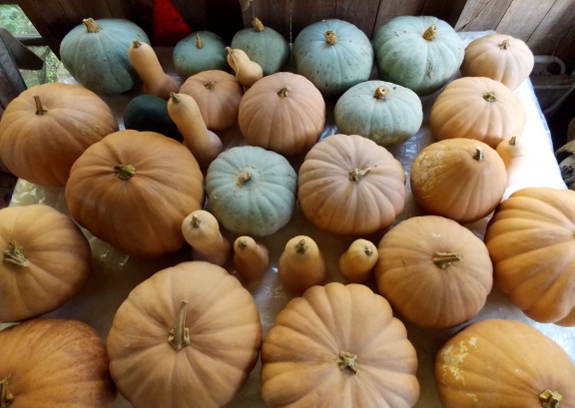 Squash are hard to grow here due to our short season, and must be under hoops, which creates difficulties with those that really like to spread. I am trying a coup,e new varieties after reading her book, though. Maybe this year will e better than last.., We are currently plant based eaters. I say "currently" because I have really been craving meat lately.